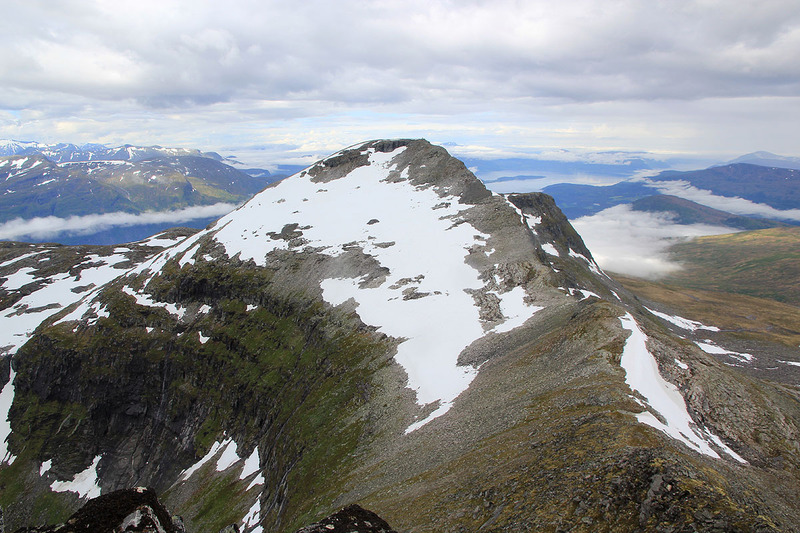 This description is an easy (class 2) route to Indre Sula, an alternative is to climb the lower Ytre Sula first, then scramble (class 3) along the ridge to Indre Sula. After about 12 kilometer, turn left onto Hwy. 671 with signs for Todalen. Measure from here. At kilometer 13.1, you should see the very first building on your left hand side. Turn left here onto a small farmers road. Note that this is immediately before a bridge on the main highway. At kilometer 13.2 (that is after about 100 meter), this road curves left and you cross a gate. Hopefully, this gate is open! Continue steeply uphill on this pretty good forest road. At kilometer 15.0, there is a fork, turn sharply left and continue even more steeply uphill before a final horizontal section with a small parking area at kilometer 15.5. In 2013, the road ended here, but there were signs indicating that the road may be extended on a bridge crossing the nearby creek. Park here, this is a good point from where to start hiking, location N62.82997, E008.72820, elevation about 435 meter. Walk uphill directly from your parking, do not cross the creek. Ascend slightly right and follow a natural clearing/ridge uphill. You will almost immediately bump into a small trail marked with orange paint (on trees and rocks). The trail is quite faint, however the marking is pretty frequent and thus, it is easy to follow the route. 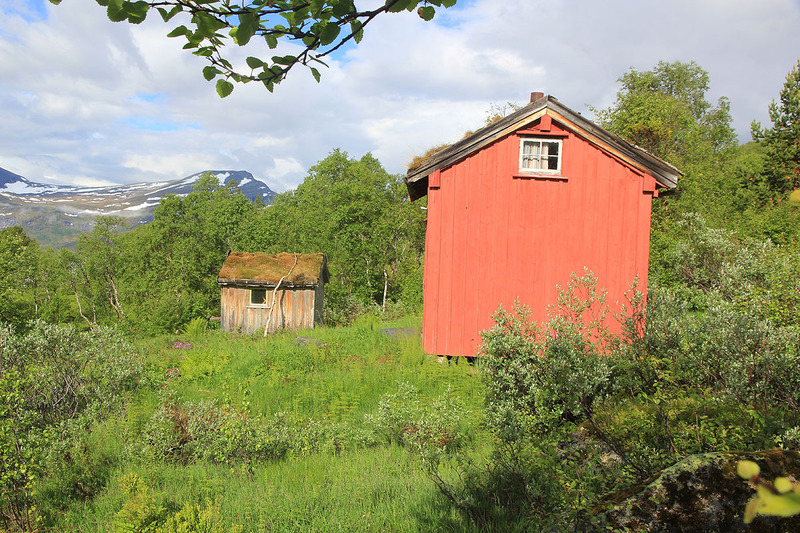 The trail serves a red hut located near the tree line. 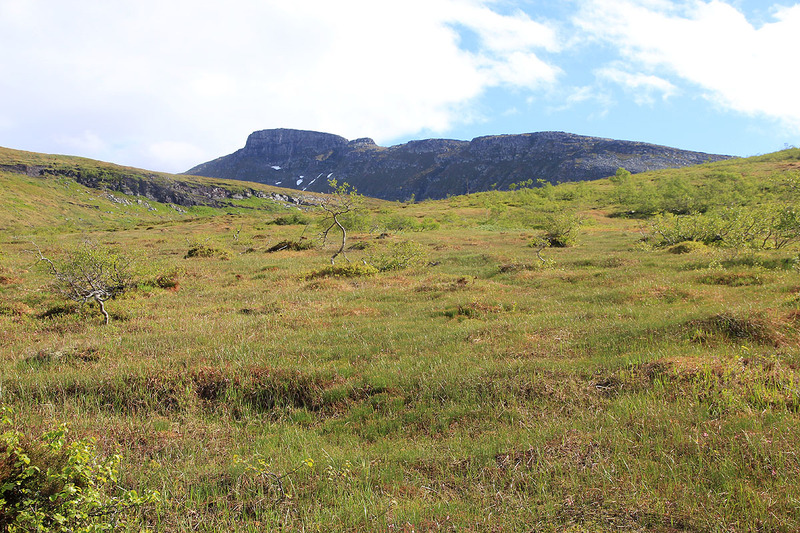 From here, turn more right and follow the very gentle slopes uphill directly towards the lower end of the south ridge from Indre Sula. 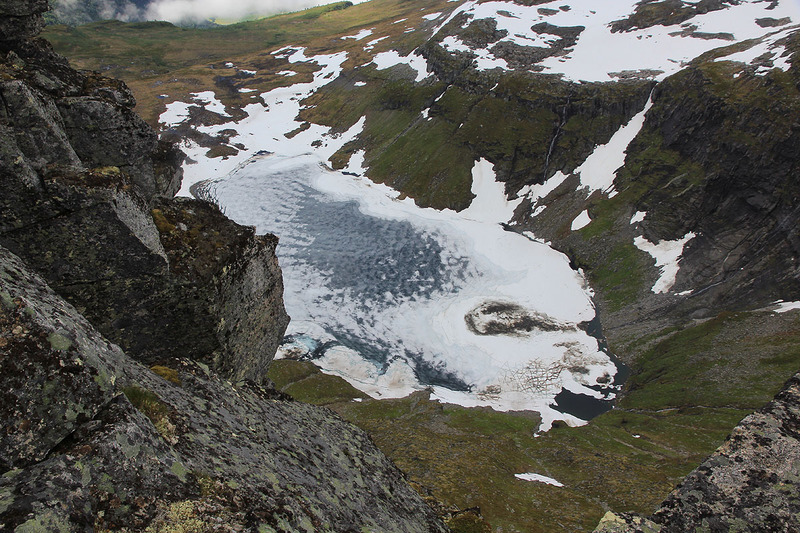 First, ascend a small step between some cliffs and cross a final, flat plateau where you also cross the creek that drains from lake Sulvatnet. Ascend the lower part of the ridge, then cross and locate an easy passage (several options) into the small basin (Litlbotnen) behind. Ascend from this basin, keeping a bit right to avoid the steeper slope. The terrain is easy, the rocks are stable and forms nice steps in many areas. 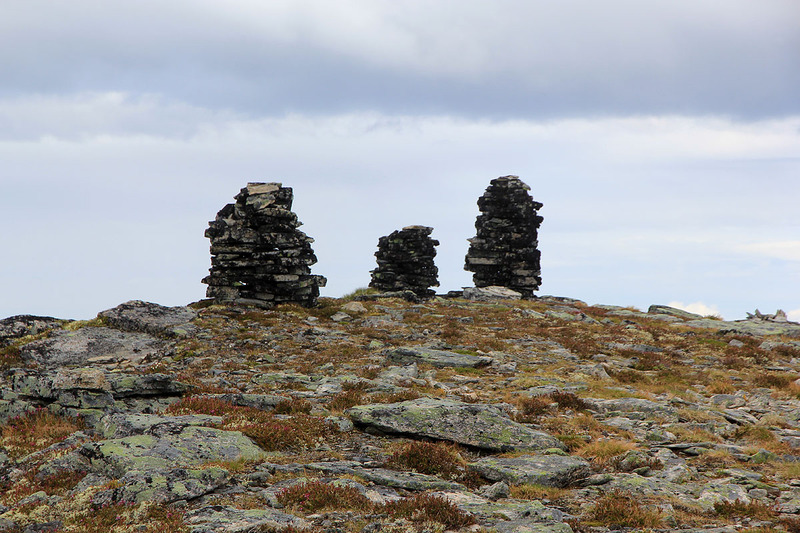 Complete the easy ascent along the upper part of the south-east ridge to gain a fine summit marked with three cairns. 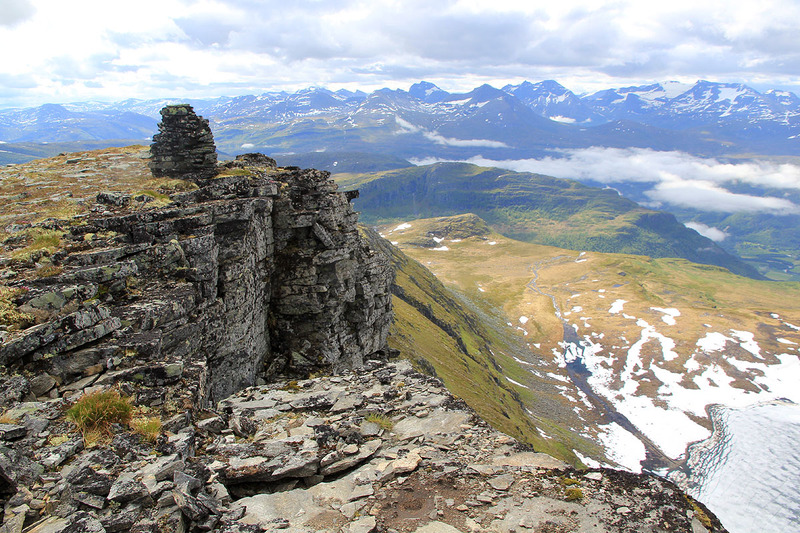 I had breakfast at Todalshytta after my strenuous climb of Viromkjerringa the previous day. Driving across, it was easy to locate the forest road and it was an unexpected bonus to observe that the gate was open and that the road was in good condition for a normal passenger car. I left the car at 0855. Already having gained an unexpected 400 vertical meter was nice and my motivation for an additional 200 meter bushwalk to treeline, quite high. However, after just about 50 meter, I ran into a trail clearly marked with orange paint. This climb looked more and more feasible. Arriving at the small farm hut, the view was nice and the weather improving. The terrain higher up was indeed perfect for walking. I crossed the south ridge in a place that was a bit tricky, steep cliffs with a bergschrund between the snow field in the basin below. However, a passage was soon found and to my delight the rocks at the far end of the basin were completely stable and formed a staircase. 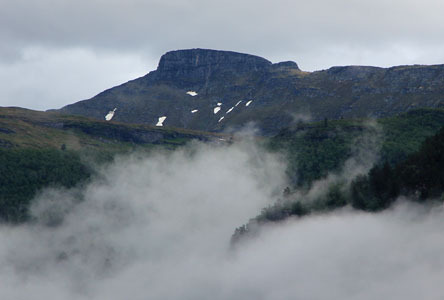 The rest was just a nice stroll as I arrived at the Indre Sula summit at 1110. This was a nice summit, steep cliffs and a great view. I stayed around until 1130, then returned along the same route getting back to the car already at 1300.